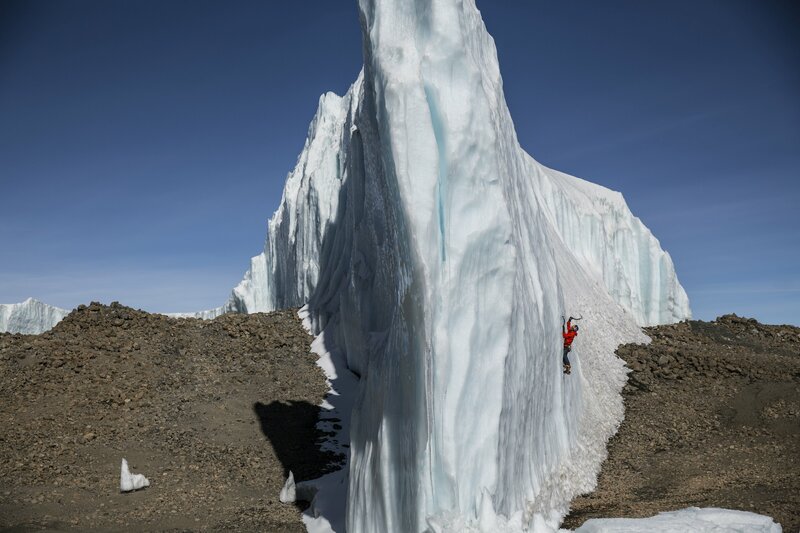 Will Gadd ice climbing near the summit at 19,000 feet on the glacier ice on Mount Kilimanjaro in Tanzania, Africa on October 31, 2014. Photo: Christian Pondella/Red Bull Content Pool. With early blueish light coming through a friend’s kitchen window in Ouray, Colorado, and warm bread on the wooden table, Xander Bianchi quietly cleared his throat and looked up from his coffee. “We live and die by the weather forecast,” he said. “We can obviously only make ice if it’s cold enough. 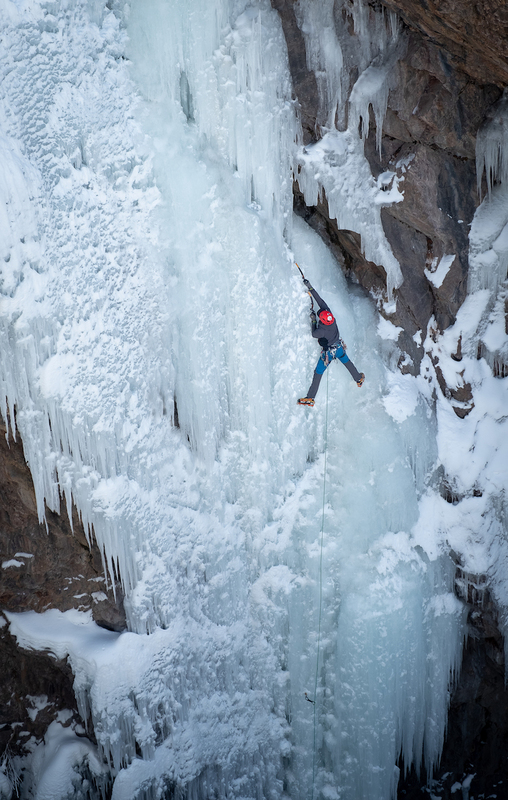 Last season was really good, 100 days ... [but] 2016-2017 was the shortest season on record.” Lead ice farmer at the Ouray Ice Park for the last four years, he is one of a team of four—managed by Logan Tyler—who create and manage ice routes along the mile-long park. I had traveled to Ouray, site of the non-profit, 100-route ice park, for the area’s annual Ice Festival, from January 24 to 27. Originally founded in 1997, the ice park had beckoned me back every year since my first visit, in 2016. I had reached out to both Xander Bianchi and Kitty Calhoun—an accomplished alpinist and guide—asking to discuss climate change... and what it means for us: as climbers, ambassadors of the mountains, and residents of this planet. I met Bianchi—a quiet, tall 20-something-year-old with glasses and a homemade notebook in hand—at 7:50 a.m. to carpool to Calhoun’s home and meet at 8 before she left to teach two ice clinics for the festival. Calhoun grew up in South Carolina, but now splits her time between Ouray and Castle Valley, Utah. I had no clue by looking at her how old she was, but I could tell by her precision—even just the way her arm maintained a perfect 90-degree angle while she poured steaming black coffee—that she had mastered purposeful movement. Her biceps shaped the sleeves of her pullover from underneath. I pulled up a stool and, sock-footed, the three of us—Xander, Kitty and I—began. 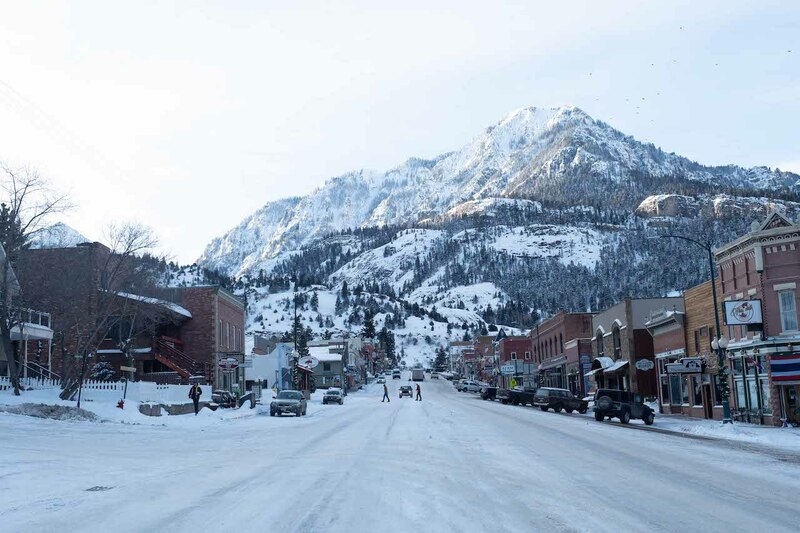 Ouray, Colorado, the weekend of the 2019 Ouray Ice Festival. Photo: Caden Handley. Bianchi spoke about a Ouray local who eagerly showed up to the Cordillera Blanca mountain range in Peru, guidebook in hand, only to be laughed at by locals and informed that those ice climbs hadn’t been in for five years. Calhoun shared the story of her rare 2005 ascent of the Diamond Couloir on Mount Kenya. “Our friends got a repeat,” she said, “and another party may have gotten a repeat that summer, but since then, it hasn’t been repeated.“ (She was unaware that the route was repeated in October 2018 by Tristan Firman and Julian Wright). I thought of myself at 18, strapping my crampons onto the wrong feet and clumsily swinging an ice axe for the first time. Winter ice climbing had become a benchmark of sorts for me over the past four years; whereas I once measured time by the town I was living in or who I was seeing, I had begun to remember events in a calendar that began and ended each year with my return to ice climb in Ouray. It was a gut punch to envision a future without frozen nose hairs and the exhilarating fear so specific to a heady run-out on ice. “Do you think that ice climbing will ever vanish?” I asked, looking into the eyes of the two climbers across from me, back and forth. Neither spoke for several seconds. Snow fell outside. 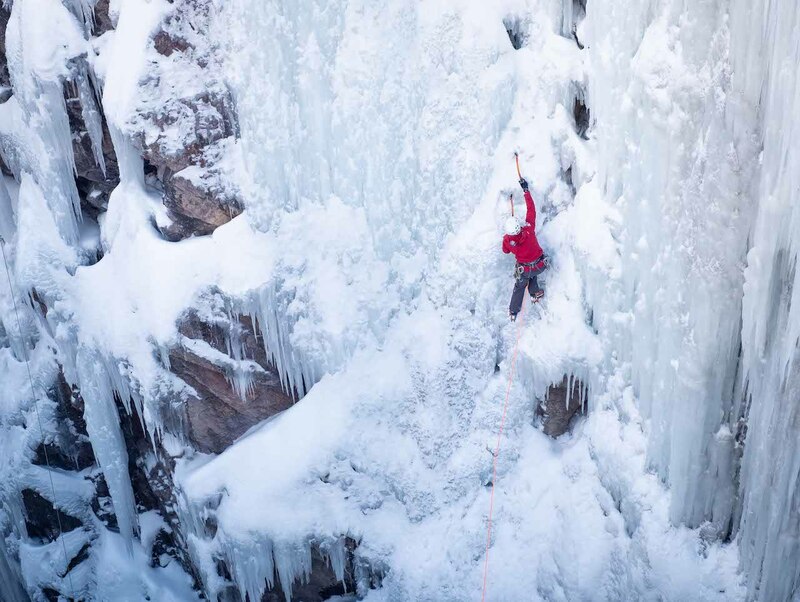 As an ice farmer and local climber, Bianchi interacts daily with one of the premier ice-climbing destinations in America, which is losing ice rapidly, even at an elevation of 8,200 feet. An October UN report validates the climbers’ concerns. 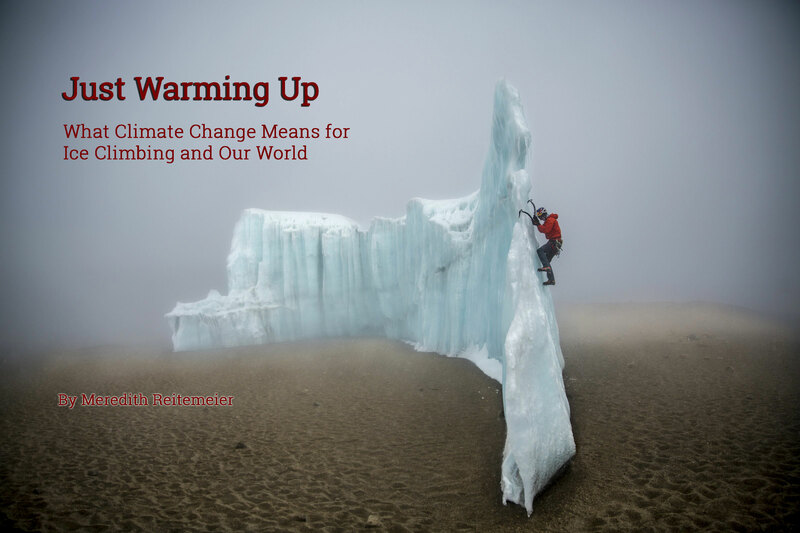 According to the website un.org, temperatures have already risen 1.8 degrees Fahrenheit (1 degree Celsius) as a result of our impact as humans. The impact, that is, of farmers and industrial employees, of the 26.5 pounds of fertilizer one American uses—indirectly—to support his or her annual beef intake, or consuming any of the other 70 billion animals annually raised for human consumption. Or forgetting to turn off your lights. The impact of you and I taking a road trip to Moab or boarding a plane to Kalymnos. I should have walked to Kitty’s. Unknown climber in the Schoolyard sector of the Ouray Ice Park, Ouray, Colorado. Photo: Caden Handley. Even if we are able to make drastic changes and bring rising temperatures to a halt at a 1.5-degree-Celsius increase, some damage cannot be undone. According to a landmark report in the Hindu Kush-Himalaya Assessment, which conducted a five-year research project ending in 2017, one third of the Himalayan Ice Fields, which supply water to 250 million people, will be gone by 2100. These melted glaciers will swell rivers and end up in lakes that cannot hold all of the water. The lakes will burst and flood surrounding communities. If we are unable to cap rising temperatures, we will lose two thirds of the glaciers by the same year. This terrifying threshold which the UN claims will signal “long-lasting or irreversible changes, such as the loss of some ecosystems,” is only 0.9 degrees Fahrenheit away from where we stand now, and the UN predicts we could reach it by as soon as 2030. Gadd, a dual citizen in Canada and the United States, said, “As people who live in the United States, we often don’t see the effects of U.S. policy in our day-to-day lives. But it’s going to hit us too, eventually, because we all live on earth.” In 2014, Gadd climbed the only remaining section of glacier left on Mount Kilimanjaro. He said: “The climbing seasons aren’t what worries me. ... The world can do without ice climbing. I’m worried about monsoon seasons, and changes in crop production; they’re building skateparks in Ilulissat, Greenland, because their summers are so much longer." Will Gadd ice climbing near the summit at 19,000 feet on the glacier ice on Mount Kilimanjaro in Tanzania, Africa on October 29, 2014. Photo: Christian Pondella/Red Bull Content Pool. I’m worried, too: about the 600 people of Shishmaref, Alaska, who watch seven-and-a-half feet of their island slip into the sea every year, when it’s only a quarter-mile wide to begin with. Herds of horses died of heat stroke in Australia while the Midwest experienced a life-threatening polar vortex. Bolivia’s largest lake is gone, and Iran’s is hanging by a thread. You don’t need to be an activist, mountaineer or world-class outdoor athlete to make a difference. Calhoun had said in her kitchen that morning, “People are waiting for top-down instruction on an issue that is ground-up.” She drew a pyramid in the air with her fingers. I thought of people standing around looking at the top of the pyramid, waiting for instruction: from government, from a leader, from anyone. Yet there are enough of us at the bottom to make a difference if we begin making changes. This power can be hard to recognize in small amendments, but it is there; you can tailor change to fit your circumstance. Maybe it means starting to participate more in local or national politicals, walking to work, or buying less beef. Maybe it means turning your thermostat down a few degrees, creating a compost, or deciding to stop shopping online; driving to the store is still less harmful than a shipping truck traveling much farther to deliver to you. How you decide to begin is not as important as simply beginning. If you hold any stock in our landscapes or future generations at all, I’m talking to you. If you’ve ever shared in the staples of a climbing trip: laughter bouncing off canyon walls, the charge of campfire coffee; or seen the bob of headlamps in the dark, I’m talking to you. Have you ever riffled the dog-eared pages of guidebooks, heard the synchronized cadence of gear on harnesses as your group embarks on an alpine start? This is what we stand to lose. Have you driven home with three crashpads strapped to the top of your car and a soft, pink sunset in your rearview mirror? With chalked skin clad in scrapes and dried sweat? Have you squished mud between your toes on a lakeshore? Or watched your breath hang in front of you on a freezing day? And so whoever, wherever you are—I’m talking to you. Meredith Reitemeier is from Parsons, Kansas. After graduating in spring of 2018 from the University of Arkansas with a degree in creative writing, Meredith packed up her car and moved to the Red River Gorge to climb and write. She now lives in Glenwood Springs, Colorado. Climbing in Ouray Ice Park, Ouray, Colorado. Photo: Caden Handley.